On 24 July 2017, UNU-IAS entered into a new collaborative agreement with the Intergovernmental Science–Policy Platform on Biodiversity and Ecosystem Services (IPBES). 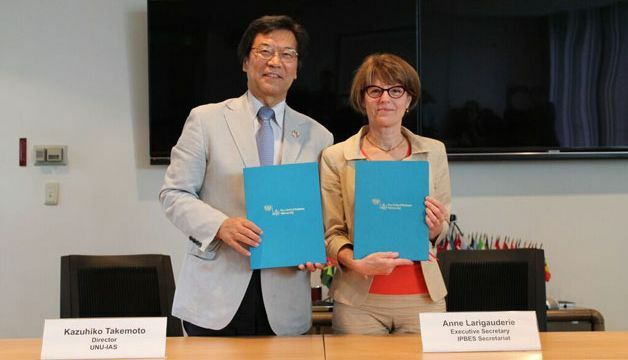 A letter of agreement (LoA) was signed by UNU-IAS Director Kazuhiko Takemoto and IPBES Executive Secretary Anne Larigauderie, at a formal event at UNU Headquarters. With this agreement, both partners expressed their intention to identify opportunities for additional cooperation in the areas of capacity building, indigenous and local knowledge systems, and knowledge and data. Their overlapping mandates offer the potential to expand their existing collaboration and develop more joint activities, and at the same time support internationally agreed environment objectives and the Sustainable Development Goals. For example, the agreement recognizes that the wider UNU-IAS community and networks such as the Global RCE Network and the International Partnership for the Satoyama Initiative (IPSI) could offer IPBES closer access to stakeholders at the sub-national and local levels, especially in areas such as biocultural diversity and sustainable development.